A man found guilty of avoiding tax and national insurance contributions totalling more than £600,000 has been jailed for five years. 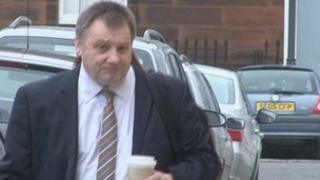 Stephen Maxwell, 53, of Dalbeattie, had denied committing the offence between April 1999 and May 2008. However, he was found guilty by a jury following a six-week trial at Kirkcudbright Sheriff Court. His jail term was backdated to March and a proceeds of crime hearing was adjourned until August. Maxwell was originally charged with avoiding payments of more than £1.7m. However, that amount was subsequently reduced and charges against his wife, Susan, were dropped. Maxwell, who was said to own offshore companies in the Isle of Man and Gibraltar, was also accused of putting assets beyond the reach of creditors, in particular HMRC, by purchasing Barncailzie Hall at Springholm, near Castle Douglas. Media captionDavid Odd of HMRC in Scotland explains the investigation which led to Stephen Maxwell's conviction. Advocate Andrew Murphy said the scheme was not his client's invention, but he had persisted in it for a number of years. He said Maxwell's accountant and financial advisers had brought him into the offshore scheme which was the basis for the indictment. "Even to tax experts it is a law which is complex," he said. "His error was maybe, at an early stage, he did not seek sound advice about the legality of the scheme and this was compounded by not being up front with the income tax and bankruptcy. "He made no effort whatsoever to make payment, and once into the scheme he did not seek a way of finding a way out." The tax system depends on people being honest but Maxwell consistently tried to conceal his income. Mr Murphy said Maxwell had simply "blindly carried on" and hoped not to be discovered. "He was obsessed with computers and it seems he had a high talent, which was probably wasted," added Mr Murphy. "He revelled in solving computer problems and worked seven days a week and all his holidays." Mr Murphy said that the scheme had not brought Maxwell financial rewards and he had lost everything, including his house in England and his house and estate in Dumfries and Galloway. However, Sheriff Kenneth Robb said he did not agree that nobody had been harmed by the offence. He said that in an age of financial constraints, £635,000 was a lot of money which could have helped the public purse. He told Maxwell: "You have enjoyed the fruits of your labour and the tax that you should have paid. "The tree may be bare, but you used the fruits over many years." David Odd, HMRC's assistant director of criminal investigation in Scotland, said: "This was a case of deliberate and systematic fraud. "The tax system depends on people being honest but Maxwell consistently tried to conceal his income. "Income tax fraud is not a victimless crime and HMRC take a very serious view of anyone who acts in this manner. "We have robust procedures to identify abuse of our tax systems and are committed to pursuing any such fraud vigorously."